« What’s the Best Tax Policy for Working Families? Now I’m confused. I thought that high tax rates were essential to enable the government to provide quality government services, and that these services benefit the economy as a whole. 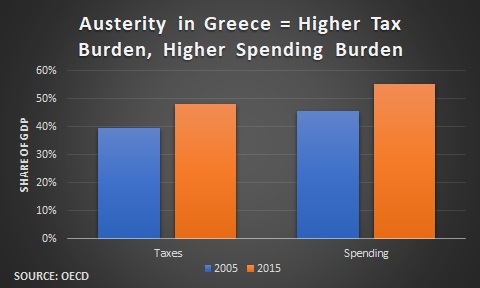 If Greece’s taxes are high, shouldn’t this just automatically mean that the country is prospering? Shouldn’t people from low-tax countries be clamoring to get in to this workers’ paradise? I say abolish the Greek government… and turn the country over to Disney for management… Macau………… look out! That’s how”solidarity to a life of decency” ends. 1. Coercive collectivism — and the demands it places on the individual — lowers personal incentives to work, suppresses creativity, and stifles lifetime ambition. 3. Growth either stagnates or settles to the typical European welfare state one to two percent long term trendline while the rest of the world grows two, three and five fold faster. 5. A malaise sets in as the effect of economic underperformance and continuous slide on the worldwide prosperity rankings sets in. 6. A desperate voter-lemming public tries to hang on to a once glorious top ranking standard of living through direct and indirect redistribution. 7. Go back to step 1 for more coercive collectivism– until decline is complete. It is this the process of fundamental western developed world voter-lemming decline that is unfolding right before our own very eyes. Yet, we will double gown on hope. Hope that one day… one day… one day.. the dream will come true…. and most citizens will be finally either convinced or coerced to abandon the nice book they are reading, leave their families every morning, drive past the golf course, the lake, the yoga class, the trail, the friends having fun practicing for the next gig, the party, the gourmet mall, the trip to Cuzco, …etc. and go hole themselves up in an office… where 8am-11am they will work for their families and then 11am-5pm they will work for the general public welfare, and all the demands this places on them. They keep hoping, they keep dreaming, they keep declining — at ever faster rates — now that everything human is moving irreversibly ever faster. You may disagree, but you don’t have a choice since they are the majority. Emigration becomes your only option. So first you emigrate your business activity, then you emigrate your capital, finally you physically emigrate yourself. The voter-lemming content of the world you are leaving behind increases, and its long term vicious cycle of decline accelerates. In the medium term Greece will continue being supported by the European Union. The European Union as a whole has also passed the point of no return and is circling the drain of low growth — but has not reached the point of collapse yet! That is still some time off, though on a historical time scale its just around the corner. In the four decades since the formation of the European Union, Europe’s share of world GDP has fallen from 35% to around 20% projected to shrink to 15% in another decade. On a historical scale, the swiftness of such decline during peacetime is unprecedented in human history. And this is the continent a majority (or near majority) of Americans wants to follow. American prosperity seems to have also jumped the shark. PS. Greece blew its unique geographical endowment of sea and sunshine — and then some. In my view, there is, after all, an element of “resource curse” in this whole Greek drama. Latin America is full of countries that “taxed themselves to death” during the 20th century. It happens by way of a vicious cycle: businesses get over-regulated and over-taxed, destroying most jobs or driving them underground. (Then the costs go up because the remaining businesses have to bribe police and local officials to keep operating.) So the people vote for whoever promises them big welfare payments. After that the only way the government can pay its bills is to print money, so you get inflation in the hundreds of percent a year. Once the death-spiral has gotten that far the country is stuck in it forever unless and until a dictator like Pinochet takes over, because any elected leader who tried to cut spending would provoke riots, get assassinated, or both.